Dr. Kelly is a 2008 graduate of Indiana University School of Dentistry, where he received the school's Kem Award for Clinical Excellence, and the American Association of Oral Biologists Award, and was named a Hinman Scholar. He also represented the IUSD chapter of the American Student Dental Association, traveling to Capitol Hill to lobby our legislators for increased access to dental care for children. Additionally, he participated in numerous dental community outreach programs while in school, paying his own way to travel throughout the state and even out of the country to provide free dental care for children. Originally from Idaho, Dr. Kelly grew up on a family farm where he learned the value of hard work. He served a two-year church mission in Argentina, where he became fluent in Spanish. 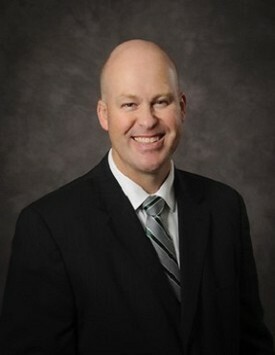 Dr. Kelly completed his undergraduate studies at Brigham Young University, majoring in English, and minoring in Chemistry, Spanish, and Zoology. In addition to the time he devoted to his studies, he enjoyed cheering at college football and basketball games and playing intramurals. He and his wife, Julie, have seven children and are actively involved in the community. In his limited spare time, Dr. Kelly enjoys reading, basketball, and water sports. He loves to spend time with his family and go on dates with his wife. Dr. Kelly enjoys dentistry for many reasons. He loves to see complex cases come together in the best interests of his patients. He really enjoys educating his patients and helping them improve their oral health. He's lucky enough to work with an office full of fantastic team members who are energetic and positive, and who truly care about their work. Most of all, he enjoys talking with his patients, and views them, first and foremost, as friends. Ruth grew up in Dubois County and graduated from Southridge High School. She received her associate degree in Dental Hygiene from the University of Southern Indiana. She joined Dr. Kelly's practice in 2008. Ruth enjoys getting to know her patients and helping them achieve good dental health. Ruth and her husband, Bob, live in Dale. In her spare time, she enjoys boating, snow skiing, hiking, and visiting her daughters. 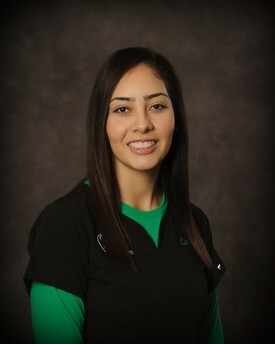 Miranda is a graduate of Southridge High School, and has worked in dentistry since 2003. She received her expanded functions dental assistant certification at the University of Louisville. She became certified in Coronal Polishing and Fluoride Application at the University of Southern Indiana. Miranda also completed the Externship program at the Midwest Implant Institute in Columbus, Ohio, in 2009, and again with Dr. Kelly in 2014. Miranda and her husband, Joey, enjoy being outdoors, hiking, four-wheel riding, and spending time with family and friends. Emily is a 2005 graduate of Jasper High School. 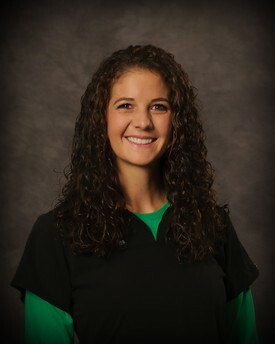 She graduated from the University of Southern Indiana in 2009 with an associate degree in Dental Assisting and a bachelor of science degree in Health Services. She subsequently earned her certificate in Coronal Polishing and Fluoride Application, and also completed the Externship with Dr. Kelly at the Midwest Implant Institute. She has worked in the dental field since 2009. Emily has been married to her husband, Kyle, since 2010. They have two sons, Nolan and Rylan, and live in Jasper, Indiana. She enjoys reading, jogging, attending her kids' sporting events, and being with family. Teresa is from Knox County and attended North Knox High School. She received a bachelor of science degree in Communications, and a minor in Chemistry from the University of Southern Indiana. 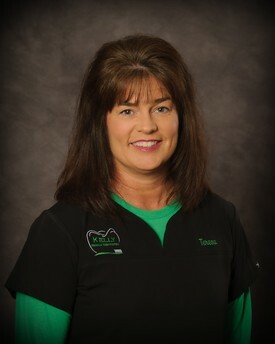 She joined Kelly Family Dentistry in 2012. Teresa and her family moved to Jasper in 2004. In her spare time, she enjoys running, reading, and attending her children's sporting events. 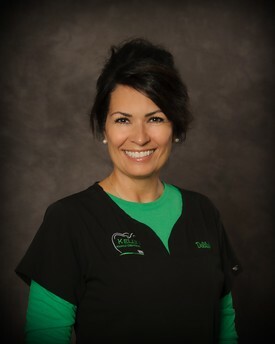 Delilah is a graduate of Crawford County High School, and has worked as a dental assistant since 1998. She received her expanded functions dental assistant training from IUPUI. She also earned her Coronal Polishing and Fluoride Application certification at the University of Southern Indiana. Additionally, she completed the Externship program at the Midwest Implant Institute in Columbus, Ohio. Delilah lives in Winslow with her husband, Jay. They enjoy traveling across the Midwest camping and horseback riding. Delilah also enjoys running, hiking, and cycling. Leah grew up in Santa Claus and graduated from Heritage Hills High School in 2008. She received her bachelor of science degree in Dental Hygiene and her Local Anesthesia permit from the University of Southern Indiana in 2013. 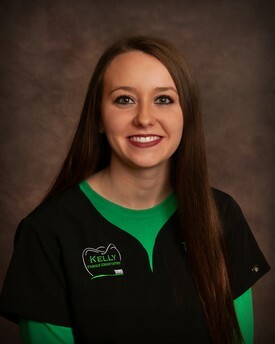 Leah joined Dr. Kelly's dental team full-time in 2016. She now lives in Tennyson with her husband, Joey, and their son, Jackson. In her spare time, Leah loves running, boating, camping, and spending time with family and friends. Cora grew up in Dale, Indiana, and graduated from Heritage Hills High School in 2014. 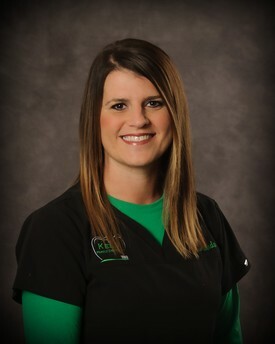 She received her bachelor of science degree in Dental Hygiene and her Local Anesthesia permit from the University of Southern Indiana in 2018. 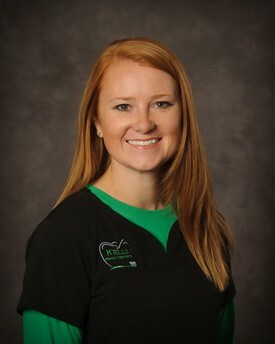 Cora first joined Kelly Family Dentistry in 2016 on a part-time basis. She enjoys taking road trips, going to baseball games, and spending time with her family. Melissa grew up in Huntingburg and graduated from Southridge High School. She received a bachelor of science degree in Marketing from Indiana State University. 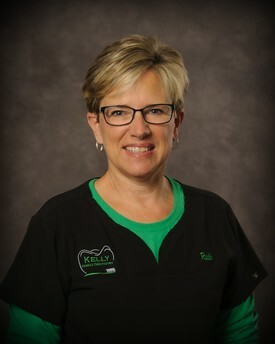 She joined Kelly Family Dentistry in 2018. Melissa and her husband, Adam, reside in Huntingburg with their four children. In her spare time, she enjoys hiking, camping, and attending her children’s sporting events. Tiffany graduated from Heritage Hills High School in 2014. She graduated from the University of Southern Indiana in 2016 with an associate degree in Dental Assisting. Tiffany received her expanded functions dental assistant training from USI, as well as her Coronal Polishing and Flouride Application certification. 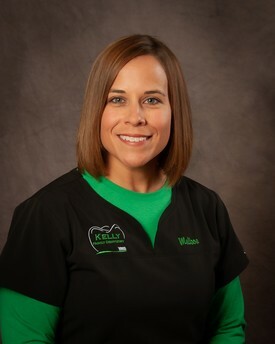 She joined Kelly Family Dentistry in 2018. Tiffany got married in April, 2018, and lives in Schnellville with her husband, Craig. They enjoy working on the farm with their herd of cattle. She enjoys baking sweets and spending time with friends and family.